On August 28, 2017, 33North launched a series of design charrettes to get your input on key aspects of The Junipers. These charrettes are interactive opportunities for our neighbors to collaborate with members of our design team. Charrette 2: Glens Neighborhood Park (9/13/17) Summary below. Charrette 3: Circulation (9/27/13) Click here to read more. Charrette 4: Parks 2 Click here to read more. On September 13, we hosted a two-hour Parks Charrette, for the second in a series of design charrettes for The Junipers. Forty neighbors were in attendance to identify desired amenities and features for a new Glens neighborhood park. 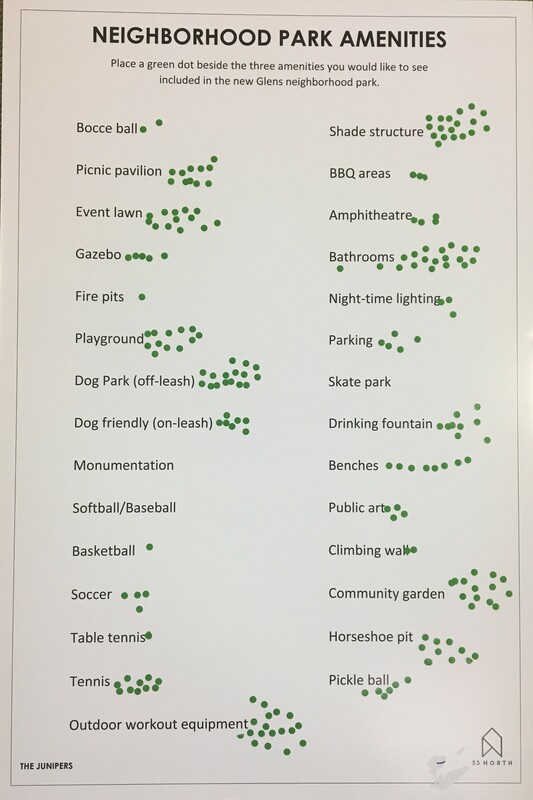 Upon arrival, attendees were given six green dots to vote on their top choices from a list of potential amenities. A fact sheet on the property, process and vision for The Junipers was placed at each seat. Charrette Two began at 7:10 p.m.
Max Frank and Jeff Warmoth of 33North welcomed everyone to the Charrette. They outlined the vision for The Junipers as an age-qualified (55+) community and encouraged attendees to review the fact sheet provided. Max and Jeff also shared that the focus of the evening was parks. Any questions not pertaining to parks would be held till the end out of respect for those who signed up to participate in the Charrette process. Max and Jeff volunteered to stay after the Charrette to respond directly to neighbors who chose to stick around. Max and Jeff encouraged attendees to think big and not limit their creativity when discussing their ideal parks. Arlene from the 33North outreach team outlined the goal and agenda for Charrette Two. She referenced excerpts from the Rancho Peñasquitos Community Plan’s description of parks, including a map of existing neighborhood parks. Arlene also shared the plans for Sienna’s Playgarden and the Rolling Hills Park renovation, and noted that The Junipers is an opportunity to get amenities and park space that is not yet available to the neighborhood. Read more about Sienna's Playgarden at Rolling Hills Park. Additionally, she shared the key takeaways from Charrette One: Community Character. Click here to read the complete summary of Charrette One. Facilitator Bruce Jett, of JETT Landscape Architecture and Design, kicked off the discussion with a review of the top vote-getters from the amenity list attendees voted on upon arrival. The amenities/features which received the most votes were bathrooms (19 votes), shade structure (18 votes) and outdoor workout equipment (18 votes). Click here to see the potential amenity list with votes. Bruce reviewed elements of neighborhood parks: active park uses, passive park uses, dog parks and playgrounds. Inspiration images were presented to demonstrate the diversity and creativity possible in park design. Next was a design activity. Using the background provided by Bruce, each table of eight residents was given a template to use to design their ideal park. The template was based on The Junipers preliminary vision provided as a tool to get the conversation started. The template was not an absolute depiction of final park space. * Final park design subject to City of San Diego design and operations processes. A representative from each table presented their ideal park to the room. Two of the six suggested that all 114 acres of the property be designated as park space. The groups who prefer there be no development participated in productive conversation on lighting, parking and safety. They also shared their preferred amenities/features which include parking, tennis, green space and bathrooms. The other four tables designed neighborhood-level parks. A dog park was incorporated into each of the six teams’ park designs. Attendees shared there are conflicts at Rolling Hills Park over dogs being off-leash so incorporating a designated off-leash element is important. Tennis courts were also included in each of the six teams’ designs. Inclusion of parking was debated yet each design included at least some parking. Outdoor exercise equipment, preferably along the trails, was a top amenity. There is a wish to have shade structures and picnic areas. Safety features, such as low-sodium lighting, were identified as important elements to discourage crime. People want restrooms to be included, however are concerned about the potential safety risks and maintenance. Green space and open grass areas were also sought-after features. The park should be accessible to the to the existing Glens neighborhood and connected to the trails planned for The Junipers. Our design team will take the suggestions, feedback and drawings from the Parks Charrette and create some preliminary sketches for the new Glens neighborhood park at The Junipers. These park plans will be shared at a subsequent Parks Charrette, possibly in October. Charrette Three: Circulation will be on Wednesday, September 27 at the Hotel Karlan from 7:00 – 9:00 p.m. The Charrette on circulation will cover issues related to vehicular, bicycle and pedestrian travel and safety as well as neighborhood interconnectivity and trails. Charrette Two adjourned at 8:55 p.m.
Only one resident chose to stay after to discuss his concerns around wildlife migration, traffic and emergency evacuation. All questions will be added to the FAQ list started at the first Charrette and will be posted in a newly created FAQ page coming soon to the website. Q&A adjourned at 9:30 p.m.